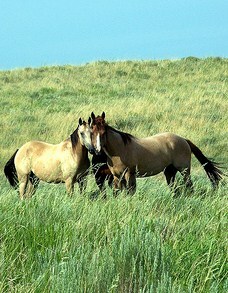 Many mares exhibit hormonal problems through mood and behaviour changes. This is often seen during a mare’s cycling days, however many mare owners report problems with their behaviour on a daily basis even when they are not cycling. Unfortunately, too many times we have simply attributed this to “mares being mares”, and have not recognized that these girls are not feeling well and that they can suffer from the same anxiety, irritability, aggression, sadness and depression as women do during PMS or an unhealthy menopause. They can also have problems with cycling pains. Pain and/or emotional symptoms make it very hard for mares to tolerate being handled or ridden, to compete and/or to cooperate with other horses. Unfortunately these behaviours often get dismissed as a personality or training problem. Hormones are powerful chemicals that have a profound effect on the neurotransmitters of the brain: estrogen has an excitatory effect on the brain, increasing serotonin and acetylcholine levels whereas progesterone has a more calming effect. Serotonin is responsible for creating positive moods and acetylcholine is necessary for focus and memory. Fortunately, when hormonal mares are supplemented with the appropriate nutrients and/or hormone-balancing herbal blends they will quickly improve to experience an increase in stable moods and suffer less depression, less aggression and more motivation. Beneficial nutritional supplements include the Riva’s Vitamin B6 (pyridoxine) and Riva’s Primrose Oil. Vitamin B6 is essential for the synthesis of both hormones and neurotransmitters and has the added benefit of regulating blood sugar levels. Vitamin B6 will also support pituitary and thyroid function as these endocrine glands rely on this vitamin for optimum health. Riva’s Primrose Oil provides essential fatty acids and 9% gamma-linolenic acid (GLA) which is found in the plant seeds of evening primrose oil. Primrose oil also has anti-inflammatory properties which helps with skin conditions and arthritis. Herbal blends for hormone balance are also available as they re-balance the estrogen and progesterone levels and calm the emotions. The Riva’s Herbal Blend for Mares contains black cohosh, blessed thistle, chamomile and wild yam root to tone the ovaries and sooth the nerves. This blend will also effectively regulate erratic cycles, ease uterine cramping and/or help to increase fertility – although it is not advisable to feed it during pregnancy. This blend has an effective stabilizing effect on moods. If the thyroid or pituitary glands are needing support in addition to the reproductive hormones then add the Riva’s Hormone Boost which contains Ashwaghanda, Chaste Berry, Kelp, Licorice Root and Raspberry Leaf. This formula will strengthen the endocrine gland system, relieve stress and balance hormone levels. It is also beneficial in cases of Equine Metabolic Syndrome, Insulin Resistance and Cushing’s since it supports the pituitary and adrenal glands and helps to regulate insulin levels and metabolism. If the hormones are stabilized but your mare still appears uncooperative with an attitude then she either has other underlying emotional issues (she needs to be heard) or the training program should be assessed. Some “mare behaviour” has been allowed to become a pattern, in which case competent but compassionate handling will help them establish new patterns. And don’t put food down in front of “cranky” mares until their ears come forward – this might take time at first but they should learn to “smile” in the presence of food. With good food, supplements and common-sense handling your mare will be a happy, healthy and willing partner. Herbal Medicine uses remedies derived from plants to treat common illnesses. These herbs are dietary supplements that you can give to your horse in its raw form or dried, through teas (infusions), extracts, tinctures and oils or as part of a combined remedy. Herbal Medicine aims to not only treat the symptoms but to introduce improvements to your horse’s lifestyle and wellbeing. Herbs have been used on people and animals for thousands of years across a range of cultures. Shamans, Medicine men and women, pharaohs, kings and field workers all knew the benefits of herbs on their people and animals. Some of the more common cultures to have used herbs on their horses were the native american indian tribes, the ancient greeks and the romany gypsies of Europe. 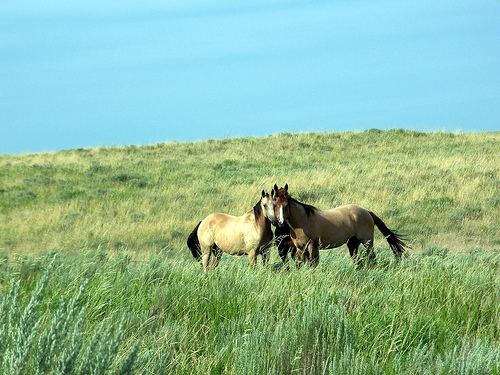 Horses also have instinctively foraged on medicinal plants native to their grasslands gaining the necessary nutrition to heal and prevent illness. Modern medicine is in fact foundered from the use and experimentation of thousands of years of herbal medicine knowledge. 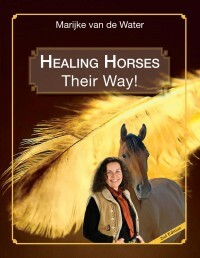 Veterinarian science and the development of pharmaceuticals has evolved directly from the accumulated wisdom of herbal history that has greatly benefited western medicine as we know it today.